Editor’s note: Passport to Cheese is Cheese Market News’ feature series exploring the dairy industries of nations around the world. Each month this series takes an in-depth look at various nations/regions’ dairy industries with coverage of their milk and cheese statistics and key issues affecting them. The nations’ interplay with the United States also is explored. This month we are pleased to introduce our latest country — Argentina. MADISON, Wis. — Political changes and shifts in leadership are occurring all over the globe, and recent changes in Argentina could bring a much-needed boost to both domestic and international dairy business in the country. The U.S. Trade Representative’s annual report on foreign trade barriers notes that a new government in Argentina, which took office late last year, has taken steps to reverse many trade-restrictive policies and measures that had been in effect. In March, the United States and Argentina also signed a bilateral Trade and Investment Framework Agreement. “It is true that we are experiencing a lot of change,” says Jose Madeira, head of the U.S. Dairy Export Council’s (USDEC) South America office, in an interview with USDEC’s Margaret Speich for a recent blog post on South America’s market-oriented shift. Madeira explains that there is a strong movement in South America toward more market-oriented economies and a more favorable attitude toward free trade. The first place this was seen is Argentina. 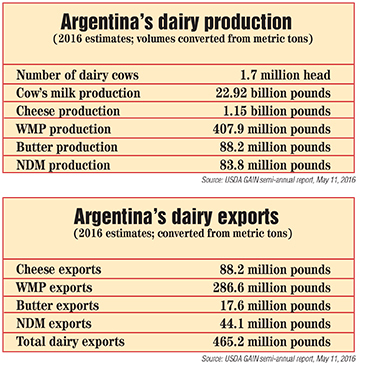 Argentina this year is home to 1.7 million head of dairy cattle, according to an updated estimate reported by USDA’s Foreign Agricultural Service in its May Global Agricultural Information Network (GAIN) semi-annual report on Argentina’s dairy industry. USDA noted in its GAIN report on Argentina issued in November that the average dairy farm in Argentina is increasing in land area, cow productivity and herd size, though a significant group of smaller farms also have been leaving the dairy business. Dairy production in Argentina still is strongly dependent on the weather, so whenever issues such as droughts or floods arise, many producers go out of business. Severe weather earlier this year resulted in significant flooding in the main dairy production provinces of Cordoba, Entre Rios and Santa Fe, Argentina, the semi-annual GAIN report says. This lowered the milk production forecast for 2016 from 11.7 to 10.4 million metric tons (22.9 billion pounds) and 2016 dairy exports down 7 percent from 2015 to 211,000 metric tons (465.2 million pounds). USDA notes that the new government, which inherited an already deteriorated dairy sector, faced an extreme crisis due to this adverse weather. The dairy industry requested immediate assistance from the government on issues such as financing, farmgate prices and export conditions. Dairy processors in Argentina have struggled in recent years amid a difficult domestic and international environment, USDA further notes. Low farmgate prices, a strong peso and an average 30-percent inflation over the past few years, as well as export restrictions through permits, reduced competitiveness and discouraged domestic and foreign investment, USDA says. The new Argentine government for February and March allocated a subsidy of 0.5 Argentine pesos (USD 3.4 cents) per liter for all dairy producers and suspended the value-added tax for 120 days, totaling a support of 0.65 Argentine pesos (USD 4.5 cents) per liter for the first 3,000 liters of milk, USDA says. Dairy products are a big part of the Argentine diet. Per capita cheese consumption is estimated to be 12-13 kilograms (26.5-28.7 pounds) a year, and USDA says this number is expected to grow slightly despite the loss of purchasing power by consumers. Despite high inflation in the country, dairy consumption remains stable, even increasing slightly due to competitive prices and special sales offered by companies. Approximately 85 percent of Argentina’s population is aware of the importance of a healthy diet, in which dairy products — especially milk — are viewed as critical and the main source of calcium, USDA adds. A survey by the National Institute of Surveys and Statistics shows that in Argentina, dairy represents 3.4 percent of total household expenses and 8 percent of food expenses. Consumers in the country also highly regard dairy produces because of the cultural perception that milk is an ideal food for children. Cheese is among the most important dairy products in Argentina, USDA says, and more than 90 percent of the country’s cheese production is consumed domestically. Soft/fresh types such as Cremoso, Saint Paulin and Mozzarella constitute 50 percent of the market. Semi-soft varieties such as Gouda and Swiss hold 38 percent market share, followed by hard cheese such as Provolone and Sardo, which account for 12 percent of the market. “The spreadable cheeses are very renowned, very popular in Argentina,” says Sandy Vassiadis, director of corporate communications, Saputo Inc.
Canadian-based Saputo Inc. in 2003 purchased one of Argentina’s major cheese and dairy processors, Molfino Hermanos S.A. Since then, Saputo has invested more than C$120 million in Molfino’s two facilities and doubled its production. Molfino produces cheese, butter, cream and milk powder under the La Paulina and Ricrem brands. The past year, Saputo increased Molfino’s presence in the Argentine market with branded retail products as well as introduced new foodservice products, contributing to an increase in domestic volumes. The company says despite difficult market conditions and an inflationary economy, its team in Argentina continues to be innovative and solution-oriented. Saputo initially looked to develop a strategic platform in Argentina to expand its exports, which were limited in Canada due to regulations that prevented competitive pricing. Argentina was a major dairy-producing country that had a more open market. Saputo now exports to more than 40 countries around the world from its platform in Argentina. SanCor, a 1,400-member dairy cooperative based in Argentina, is the country’s largest exporter and claims to have pioneered the integration of Argentina into the global economy, exporting for more than half a century. It sells its products in more than 30 countries on five continents, and today its main exported products include skim milk powder, butter and Gouda, Edam and Cheddar. While domestic dairy consumption in Argentina is strong, its dairy industry also depends heavily on exports. Dairy exports in the past few years have accounted for 20-25 percent of the country’s total output, USDA says, and primary exports include whole milk powder (WMP) and cheese. Argentina’s main dairy product markets are Brazil, Algeria, China, Russia and Venezuela. WMP exports from Argentina are projected to reach 130,000 metric tons (287.6 million pounds) in calendar year 2016, according to updated estimates in USDA’s May GAIN report. Cheese exports in 2016 are forecast to be 400,000 metric tons (88.2 million pounds). The most exported cheese variety is Mozzarella, with Brazil as the main destination of this product, USDA says. Second in export sales volume are semi-hard cheeses, mainly exported to Brazil, Chile and Japan. In September 2013, Argentina’s government announced that the use of export permits (ROEs), previously only required for a few select products, would be mandatory for most dairy products, USDA notes. Throughout 2014 and much of 2015, in an attempt to keep domestic prices low, the Argentine government limited the issuance of these ROEs. However, the new Macri administration that took office in December reversed the past government’s main policies toward the agricultural sector. These changes included the elimination earlier this year of ROEs for dairy products. Argentina’s dairy imports have been negligible, especially with the strong import restriction system imposed by the previous Argentine government, USDA says. Most of the country’s imports are caseinates and casein derivatives from Uruguay, Chile and the Netherlands. According to USDA data, the United States exported 649.1 metric tons (1.4 million pounds) of dairy products to Argentina in 2015, down 24 percent from the previous calendar year. However, the recent changes in leadership mean there could be changes in export opportunities to Argentina and other South American countries, though USDA notes that how these changes might be implemented remain uncertain. Madeira agrees in his recent USDEC interview that U.S. exporters should expect positive changes. “In the last six months, there has been a change of mentality with these new administrations in South America, and that should be good news for USDEC members,” he says.